Vacation time! But first some thoughts before I run off to the Gulf of Mexico. -Being on vacation automatically makes my legs fresh, and they also recover quicker on vacation runs. Never fails. -If this doesn’t work, and my injurious-aging self doesn’t heal, I am comforted by the FAQ section of the Bayshore Marathon website which states: "Bayshore does not offer refunds. In some cases we may allow you defer your entry to the following year as long as you notify us before May 1st." 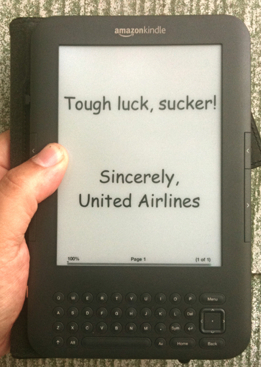 -If I had to buy an extra plane ticket in order to take my Kindle on vacation with me, the only question would be first class or coach. -I love reading about running in literature. The most recent example is Bran from 'Storm of Swords', who is paralyzed in real life but in his dreams, is a DireWolf, and declares; "There was nothing better than running, unless it was running after prey." -Last cruise I was on, the running deck was probably a third of a mile around the boat and offered some glorious morning runs. 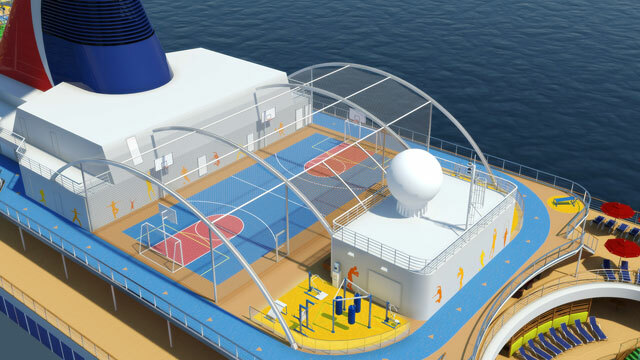 This ship I’m going on has a sports deck with a running track (strike that, a 'jogging track') which is just a 6th of a mile, but I got to believe it wasn’t built by runners. They would never do that. I’m anticipating a lot of left turns or the view from a treadmill, or perhaps running with the locales on an island stop. -Being on vacation and being sober is like being in Vegas and not gambling. You always wake up each day more rich than the person next to you. -Yes, I am floating on Carnival, whose slogan is "We provide the discounts, and leave the safety onshore." -If I do get stranded, my expectations are high. 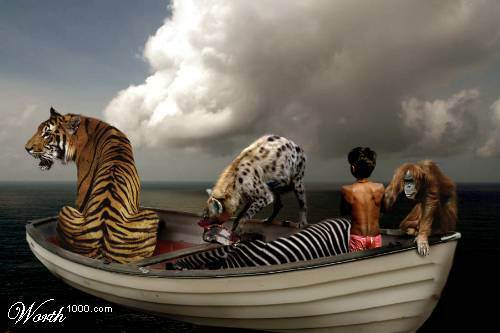 I demand a lifeboat with a tiger named Richard Parker, a Hyena, a Zebra, and an Orangutan. -If you are reading this and plan to rob my house while I am away, be forewarned that my brother-in-law will be at our house doing some work. He’s 6 foot 3 and an ex college football player and is the one who has been buying up all those guns that are about to be banned. -Plus We also have two very vicious Guinea Pigs who will stand their ground. -Some day there will be a messiah guinea pig who will lead all the Guinea Pigs away from the terrible slaughter and experimentation that has been done onto their species, and he will lead them to the promised land. 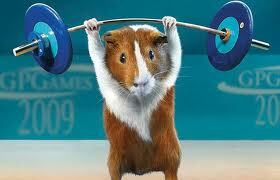 -Guinea pigs are way more interactive than you would realize, and make sounds for treats. -I’m 89% excited and 10% nervous about my next novels release. The 89% comes from a years worth of work and how deliciously twisted it is, the 10% nervous comes from being worried someone’s going to check my basement freezer for bodies. The other 1% is constipation. -The characters in this novel are my most vivid yet, the cover most striking, and the narrative tries to tattoo a burning image onto your eyeball. - My novel, STRAY, was just given some great love in a National Literature Examiner article. -The more I read about runners, the less of a runner I sometimes feel. My weekly mileage is what some folks run on a boring Tuesday. -Being nearly injured but enough you can run is a form of self water–boarding. -Marco Rubio also grabbed a gatorade and a Gu. Have a blast and may your bowels move with ease and the boat meet each destination! I had the same 1/6 track on our cruise. Two suggestions. 1 - go to the deck that is longest and run it in the morning. There were several runners on it and was more like 2.5 times instead of six. 2 - run on the island as soon as the ship docks. I did that and it was one of the best runs I've ever done. There's no way I'm breaking into your house now I know that you have guinea pigs. We used to have guinea pigs and I know that they can be ferocious, vicious killers. I once saw one of the females eat her almost full-grown progeny and I've been doing the same ever since. We don't have GPs any more and I don't know how or when they disappeared but I'm pretty certain that wherever they are, they're up to no good. I as well am an aspiring blog blogger but I'm still new to the whole thing. Do you have any tips for first-time blog writers? I'd certainly appreciate it.